During filming of Silhouette Secrets last month we were unexpectedly let down by an interviewee in London. We found ourselves, camera crew in tow, with nothing to film on a beautiful spring morning. On a whim we got the Russian motorcycle out of the shed and headed out into Oxford. The Oxford Shark (sometimes known as the Headington Shark) has always been one of my favourite sights in Oxford. Something about it takes me back to my art-school days, when crazy things like this seemed normal and sane. That it has remained in place for so many years is extraordinary. I edited this little snippet myself. It was a great exercise in how to use a film-editing programme. There is so much to learn about films. I’m having a lot of fun learning, although I’m quite glad it won’t be me editing the rest of the film! We have done a lot of filming for Silhouette Secrets, nearly a dozen interviews. Locations include the Regency Town House in Hove, the London Sketch Club, the National Portrait Gallery and Llandudno Pier in North Wales. Planned locations include a Ural sidecar journey to Cheltenham to visit the first studio of nineteenth-century silhouettist, August Edouart. August Edouart is a pivotal figure in the film. 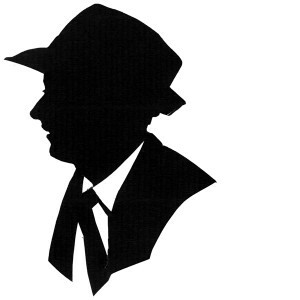 He is also a pivotal figure in the history of the silhouette. Cheltenham is the city where he cut his first portraits. As far as we can tell the shop he used as a studio, or one very like it, still stands. The plan is to take the Ural past the shop while making a running commentary on Edouart’s story, especially the story of how he learned to cut silhouettes. 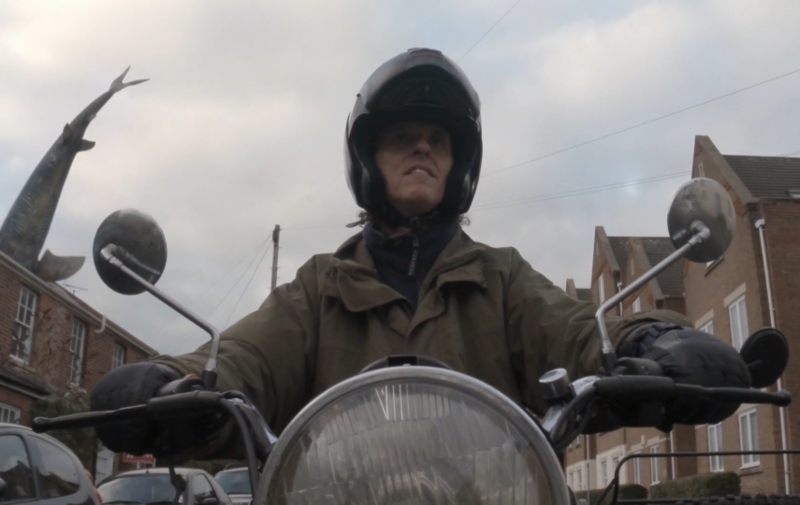 Mark, the cameraman, will be in the sidecar. Whenever I see the shark it always brings a smile to my face because it’s so daft and out of place. Once I’ve stopped grinning I start wondering. Why build it? How is it fixed? How come it’s been allowed to stay? How long wil lit last up there? And last and by no means least. How come nobody has thought to open a fish restaurant below? They almost have! Just a little bit further down the London Road there is fish and chip shop that has taken inspiration from the shark and put a huge fibreglass one on display on the flat roof above their window. A lovely homage. An excellent subject; clean smooth outline, no spikey hair, bristles, ringlets, lace trim or a fancy feather hat. I gives me hope for the World to know the shark is still there for so long. Strangely enough I was in Oxford last week, taking two young lads with a friend to the uniquely quirky Pitt Rivers Museum – a wonderful place … and on the way there, on the Oxford Tube bus, I pointed out the Headington Shark to them. How curious, then, to see that Charles had chosen it as one of his latest silhouettes … I am familiar with his portraits, but a shark … brilliant!